Was there ever a quarrel between Nawabzada Liaquat Ali Khan and Quaid-e-Azam Mohammad Ali Jinnah? Most writers who have looked into the archives say no; in fact they see the two bound in an ideal relationship within the All-India Muslim League that never soured. Liaquat was always respectful and Jinnah, in his distant way, always trusting. Recent books on the two confirm this. MR Kazimi in his Liaquat Ali Khan: His Life and Work (OUP 2003) and Roger D Long in his Dear Mr Jinnah: Selected Correspondence and Speeches of Liaquat Ali Khan (OUP 2004) have dismissed the idea that there was a Liaquat-Jinnah tension after 1947 that even exploded into mutual enmity. But the subject keeps cropping up. Since no one can understand why Jinnah died the way he did at a railway level-crossing in Karachi, people keep writing about the ‘perfidy’ of Liaquat Ali Khan. Most authors have however steered clear of the controversy and relied on the archives which say nothing about it. 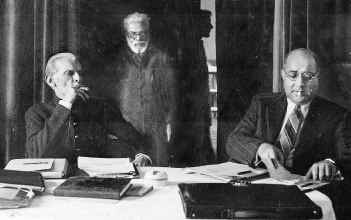 Among those who believe that there was a conflict is former chief secretary Punjab, SK Mehmood, who told daily Pakistan (27 August 2004) that prime minister Liaquat Ali Khan developed problems with governor general Quaid-e-Azam after 1947 on the question of settling the refugees from India. He said there was an over-all policy for settling them agreed at the top, but Liaquat Ali Khan wanted his own constituency carved out in Karachi by giving them special attention. The Constituent Assembly constituencies were mostly located in India. Because of these bad relations the Quaid was not looked after when he travelled from Balochistan to Karachi and died on a road in Karachi. Writing in monthly magazine Naya Zamana (1 September 2004) Naseer Ali Shah stated that relations between the Quaid and Liaquat Ali Khan were not good. He referred to the biography of Amir Abdullah Khan Rokhri Mein aur mera Pakistan and quoted that Liaquat Ali Khan’s wife Ra’na was very uppity (sar charhi hui thi) and her attitude had put off the Quaid and Miss Fatima Jinnah. Ra’na did not stop short of besmirching the name of the Quaid himself. She got Hector Bolitho to write in his book on Jinnah that the Quaid was attracted to Ra’na, and that Jinnah had put off both Ra’na and her husband Liaquat Ali Khan. The truth was that the Quaid was a cold person who could not have fallen for the charms of Ra’na Liaquat Ali Khan. Needless to say it is Liaquat who suffers in most accounts, which could be unfair. Speaking to daily Pakistan (10 April 2005) magazine, distinguished lawyer MA Rehman stated that Col Ilahi Baksh was the personal physician of Jinnah when Jinnah was recuperating in Balochistan. A son of Col Baksh, Humayun told Rehman that once when prime minister Liaquat Ali Khan had just come out after talking to the Quaid in his room, Col Ilahi Baksh went in immediately after him. Liaquat was suspicious and asked him later why he had gone in. He replied that time for administering the next dose of medicine to the Quaid was running out, so he had to run in. But Liaquat was too suspicious. He later warned him that if he talked about the incident he would punish him. When Col Ilahi Baksh wrote his book on the Quaid, Liaquat disallowed it, but when Fatima Jinnah went public about the ban, he allowed it with cuts. The ‘uncut’ book has never been found. How should one approach the controversy? The latest book MA Jinnah: Views & Reviews edited by MR Kazimi (OUP 2005) may have the answer. The answer is provided by Roger D Long Professor of History East Michigan University whose earlier editorial commentary on Liaquat’s letters and speeches is of a very high quality. In his paper Jinnah and his Right Hand, Liaquat Ali Khan he goes to the archives and digs up three documents that throw light on what really happened: Liaquat’s letter of resignation dated 27 December 1947, a memorandum by a British friend of Ra’na Liaquat Ali Khan and an undated memorandum by Ra’na Liaquat Ali Khan herself. Long also writes about the so-called Desai-Liaquat Pact which had reportedly annoyed Jinnah. He dismisses this incident as being too superficial and finds that Liaquat’s talks with the Congress leader Bhulabhai Desai were conducted without any commitment by the former over the head of Jinnah. The letter of resignation however is of great importance because it is written within months of the creation of Pakistan and tells us about some estrangement between Begum Ra’na and Jinnah. It says: ‘My wife has related to me what you told her last night at your dinner. I am sorry to learn that she has incurred your displeasure for some unknown reason. She could not have possibly done anything to merit such strong criticism and condemnation as for you to say that she was impossible and that she was digging her own grave.’ His resignation was couched in three words - ‘slipping out quietly’ - so that Jinnah as architect of Pakistan could have around him the people he felt good about. He pleaded for his wife: ‘A prime minister’s wife cannot live in a vacuum. She has to take her due place in the life of the nation, and on account of the opinion you seem to have of her it becomes very embarrassing and difficult for both of us to do our duty in the position which as the prime minister’s wife and I as prime minister occupy’. The letter of resignation becomes clearer when you read an ‘explanatory’ memorandum reproduced by Prof Long. It was penned by a close friend of Begum Ra’na, Kay Miles. The ‘background note’ says: (1)‘Begum Sahiba’s reputation as a social leader & a social service worker was being steadily strengthened and enhanced. As the result of the finesse with which she handled her position as prime minister’s wife and of the tremendous work she was doing for the refugees both personally and through the Woman’s Voluntary Service she had organised for this purpose. ‘(2) This quite unnecessarily made Miss Jinnah resentful, and jealous, although nothing was ever done to detract from her respect and position as the Quaid-e-Azam’s sister. On the contrary, out of respect and personal affectation (sic!) and friendship for Miss Jinnah, and knowing the lady’s temperament and mental and physical disabilities, every possible effort was made to avoid any kind of friction and unpleasantness. This was to no purpose, so far as Miss Jinnah was concerned, for in her growing jealousy and possessive attitude towards her brother, she steadily poisoned the mind of an already tired and sick man, whom she was also trying steadily to shut away from his friends and colleagues. ‘(3) The actual incident which gave rise Mr Jinnah’s remarks to Begum Sahiba was her non-acceptance of a glass of sherry (which she dislikes) when she sat near him at his birthday dinner party. Then he quoted an incident which had taken place just previously at a dinner party at the then Sind Governor’s House where Mr and Miss Jinnah were guests of honour, and which had been brought to his notice by Miss Jinnah with her own rendering of the facts. What had actually happened was that when an ADC had requested Begum Sahiba to sit near Miss Jinnah, she suggested that some other ladies, who did not often get it, be given the opportunity to do so on this occasion. ‘(4) Begum Sahiba naturally resented such remarks (Jinnah’s? ), especially as there was so much personal friendship and respect for Mr Jinnah, by both herself and her husband. Liaquat sent in the resignation contained in this draft the following afternoon. Immediately upon receipt of it Mr Jinnah phoned Liaquat, expressed great shock and requested him to come over to the GG House the same night. Mr Jinnah was most upset at the threat to a personal friendship and a political partnership which had weathered so many storms, and had been built on a solid foundation of mutual respect and affection. Mr Jinnah flatly refused to even consider his resignation, but Liaquat was adamant that the matter must be considered in view of the fact that he was not prepared to continue in office under such unjust aspersions on his wife, ands with the lack of stable confidence which this incident revealed. They talked the whole thing out that night, Mr Jinnah insisting that he had merely spoken as a father out of affection for Begum Sahiba, and requesting Liaquat to promise him that neither Begum Sahiba nor Miss Jinnah be allowed to come between them in their friendship. The third piece of written evidence produced by Prof Long is Jinnah’s pen-sketch by Begun Ra’na. It says: ‘He was a man of high principles and there was no bluff in him. He had nothing in common with the masses and yet they acknowledged him as their leader and followed him. Mr Jinnah was reserved and aloof and gave the impression of being haughty and conceited but once you got to know him he was human. He could sit for hours and relate amusing tales of high school and college days. He knew the value of money since he had earned every penny of it. He spent generously on his clothes, carpets, furniture, etc, but refused to subscribe to any funds – a peculiar trait indeed. He was not given to entertaining and was not very social at parties, but whenever we invited him, he let himself go and got into the spirit of the function – he cracked jokes with the guests. Was the quarrel then only with Miss Fatima Jinnah? We know that after Jinnah’s death Miss Jinnah’s address to the nation on radio was selectively ‘switched off’. Was Jinnah ‘unhappy’ with Liaquat? There is also the ‘rumour’ that Jinnah’s first choice for Pakistan’s prime minister was not Liaquat but Nawab of Bhopal Hamidullah Khan. The Nawab’s daughter, in her memoirs Abida Sultaan: Memoirs of a Rebel Princess (OUP) refers to this rumour. Nawab Hamidullah, known to be close to Jinnah, wanted to come to Pakistan but didn’t want to lose the Bhopal purse. He wanted Abida to take over as Begum, get the generous purse and some property the Indian government promised to those who would accede to India, then remit Rs 5 lakh (later Rs 10 lakh) to Hamidullah in Pakistan where he wanted to migrate! She refused to become the Begum and ran away to Pakistan herself, thus preventing her father’s prospect of becoming the prime minister of Pakistan!